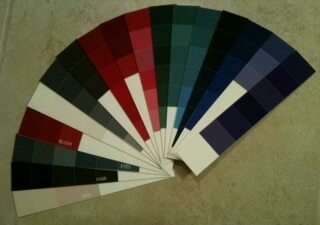 The critical starting point for your optimal wardrobe is individualized color information. Absolutely nothing makes more difference in your wardrobe than the element of COLOR. When you learn to choose only the clothing colors that make YOU look and feel fabulous, shopping becomes faster and easier. Your figure will look trimmer and more balanced. And you’ll have more mix-and-match options than you ever imagined! In a private appointment we individually select - from nearly 1800 color options - the precise hues, values and intensities that spotlight your unique personal coloring. We’ll identify your personal power neutrals, your most flattering shade of “white”, most effective accent colors, the best metallic for jewelry and accessories and much more. Our interactive process lets you understand exactly how the information is developed, so you can adopt the recommendations with complete confidence, even if you’ve been disappointed with other color information in the past. You get fabric-like swatches of the colors chosen exclusively for you, plus a customized workbook and coaching in how to interpret and apply them every time you shop. Don’t make another wardrobe purchase without this critical information. Private session cost $329. Scroll down to see how improved color choices transform women’s appearance. In the first photo, Christina’s entire face appears lifted and smoothed, simply by surrounding her with colors that are more in harmony with her deep, rich, warm personal coloring. Her hair looks more lively and filled with highlights and she appears younger and more rested. And most important – your attention goes more to her face and less to the fabric she is “wearing”. Kim’s deep, rich coloring is completely overwhelmed by the traditional black/white mix. Replacing the bright white with a rich cream improves the balance, but still isn’t optimal. See how Kim’s face shows up more in the deep, rich color scheme on the right? Her eyes become a focal point and her lips and cheeks get a rosy glow, even though we didn’t change her makeup at all. Stephanie has strawberry blonde hair and a peaches-and-cream complexion. The “universal” black and white combination dulls her hair and throws a glare on her face that makes her look almost ghostly pale. Draped in best colors, her complexion is glowing, the golden red shows more richly in her hair, and you focus on her face more fully. Marcy’s silver hair and dark eyes make her sparkle, but abrupt black and white is too strong even for her. Saturated pinks and purples, mixed with shades of gray and an outline of black, are one example of a perfect balance for Marcy. The print and her face become one unified picture. See how focus moves from her nose (in the left photo) to her eyes (in the right one)? Why is this system better than the old Summer-Winter thing? Rather than forcing people into a pre-set category and providing generic recommendations, this system is entirely personalized for each individual. Even within each seasonal category you’ll find women who don’t look all that similar. So they couldn’t possibly all be optimized by the identical colors, right? And many, many women simply don’t fit any of the seasonal stereotypes. We need about an hour of face-to-face time to develop your information. Since each Color Fan is fully customized and individually made, it will be delivered to you either by mail or in person within 10 days. Your clothing choices don’t matter at all; we can drape over any wardrobe choice that proves distracting. Although a bare face is preferred, we realize that not every situation allows for that. We can look past light, subtle makeup if necessary. If I had my colors done years ago, do I need an update? If your coloring – especially your hair color – has changed since the there’s a good chance you are due for a refresh. I focus on hair for this recommendation because individual women are the most aware of that change and less aware that skin and eye colors also diminish in pigment through the years. Will my color recommendations stay the same in the future? To the degree that you own coloring stays the same, Yes. But if your coloring continues to change – and most of us do – then you may want an update later. 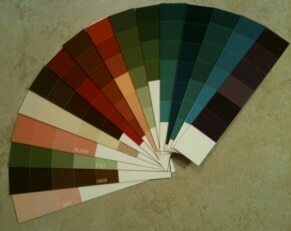 We offer updates to our color work at lower price than a full consultation. The exact amount depends on how extensive the re-do is. Read what past clients say about the value of this service. Then call or email to schedule a face-to-face appointment or to learn about our distance consultations via photograph.